My very best friends and I have a super-amazing tradition. It all started way back in late-summer 2010, when I’d been living in DC for just over a year. I saw a Groupon deal for a one-man show of The Lord of the Rings, and sent out an email to a random group of friends – Hey, This looks like it might be awesome and I’d really like to go. Anyone interested in coming with me? We decided to celebrate by watching the movies while eating LOTR-themed food. None of us has the stamina to do all the movies at once, so this became a 3-part party: over the course of late September through October we took turns hosting, choosing different Middle Earth species-themed food for each movie: The Fellowship of the Ring = Hobbits; The Two Towers = Elves and Ents; The Return of the King = Orcs and Men. Anyone who liked LOTR was welcome, so these nights ranged from 5-15 people! Up until that time, we’d all been friends separately – I was friends with 6x6 through work and running, LLC was(/is) my Long Lost Cousin (obviously), and LOTR-Emily and I had lived together for almost a year – but our LOTR parties solidified us as a group. The first series was such a success that we just had to do it again in 2011 (when Uruk-hai joined the party, bringing super-extended Blu-Ray to the table). And two occurrences clearly makes it a thing, so there was no question of not doing it in 2012. Now let’s talk food, since that’s about 75% of the fun! I’ve made Hobbit Truffle Cakeballs, Lembas Bread (shortbread), “Red Sun Rises at Dawn, Blood Has Been Spilled this Morn” Cupcakes, Dead Marshes Dip (not photogenic enough for the blog, but similar to this), and now: THE ONE RING CAKE. As we watched the lighting of the beacons, Faramir riding out to re-take Osgiliath, and Frodo and Sam struggle up Mt. Doom, this cake kept us good company. Even if you don’t love LOTR (what? No.) you should make this cake. 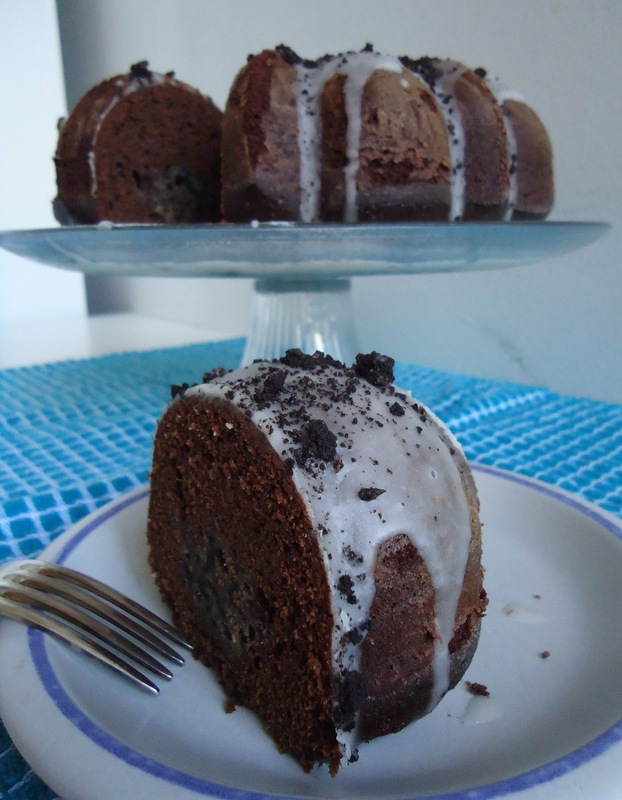 Preparation: Heat oven to 350 degrees F. Grease or spray bundt pan and lightly coat with cocoa powder or flour. 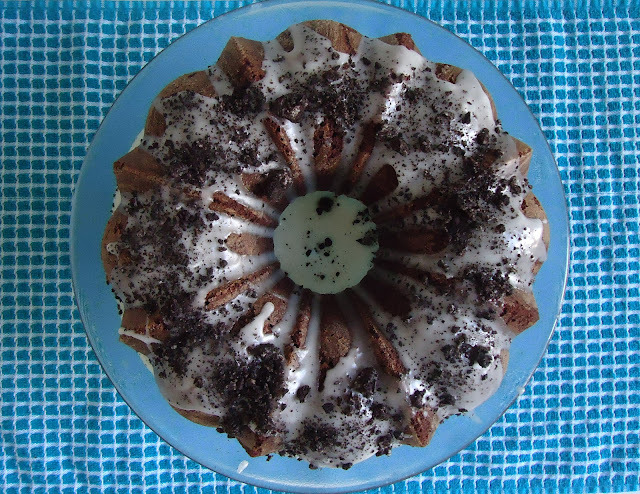 Place Oreos in a food processor bowl and pulse until crumbled. OR, place Oreo is a Ziploc bag and use a rolling pin to crush them. Set aside 1 tablespoon of crushed Oreos for icing. Place all ingredients in a bowl and beat until combined. Refrigerate until ready to use. Place flour, baking soda and salt and whisk to combine. Set aside. In a heat proof bowl, add cocoa and whisk in boiling coffee/water. Add in chopped chocolate and whisk until combined. Add in buttermilk and whisk until combined. Mix melted butter and sugar in a large bowl. Add in egg whites and beat until light and fluffy. Add in vanilla and beat until combined. 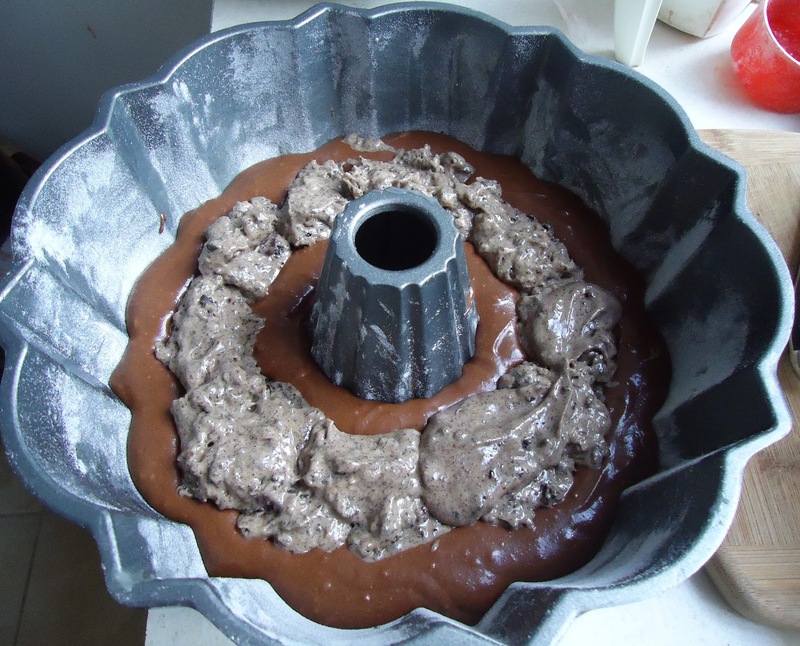 Fold flour into wet mixture in 3 batches, alternating with cocoa mixture. Pour half of batter into pan. 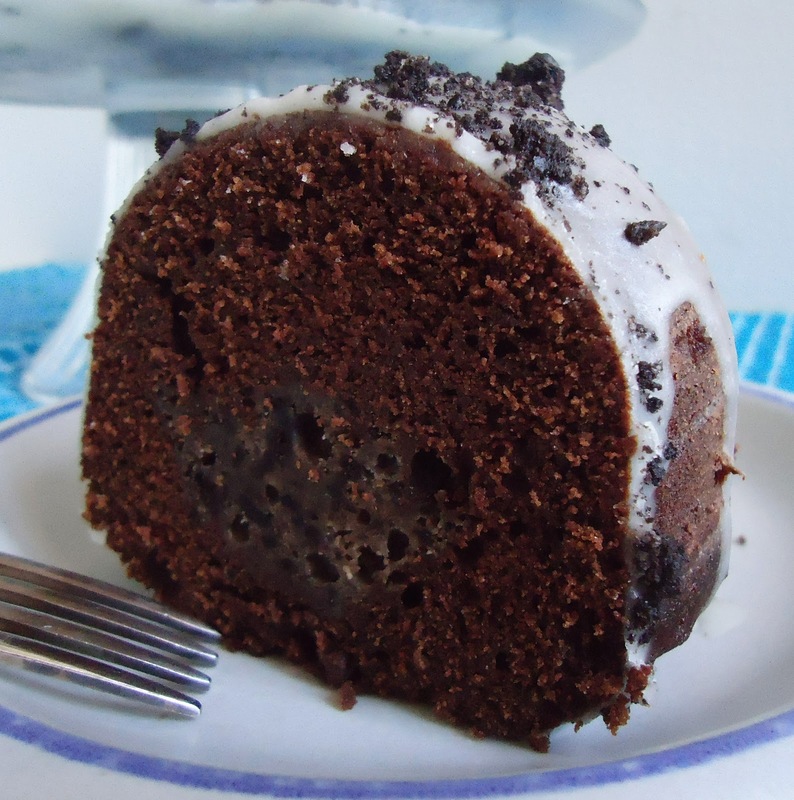 Using a spoon, make a well for the Oreo filling and evenly spoon it in, keeping filling toward the center. Pour remaining batter on top. Bake at 350 degrees F for about 50-60 minutes or until the cake starts to pull away from the sides of the pan. Remove from the oven and set on a wire rack to cool for 5 minutes. Place a wire cooling rack on top of the cake and carefully turn over – remove the pan and let cool completely. Add confectioner sugar and buttermilk into a bowl and whisk to combine. Add more milk as needed to thin icing to preferred consistency. 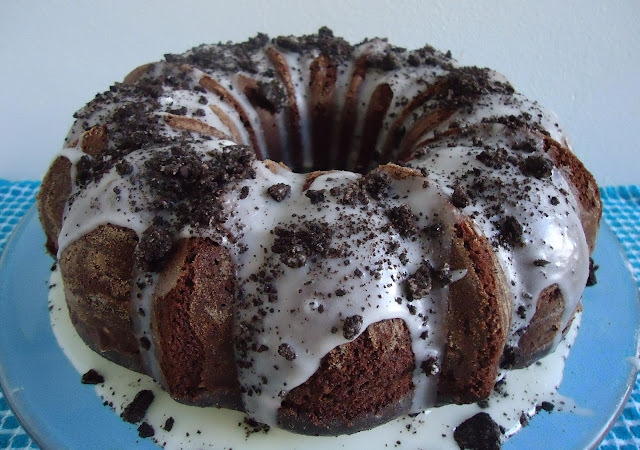 Pour icing over bundt cake and sprinkle remaining Oreo crumbs on top.